Video Tutorials - Set The Hook. This page is dedicated to video tutorials that I have compiled for a variety of apps in the iTunes App Store. Please feel free to scroll through, check them out, and let me know what you think. If there is a specific app that you would like to see a tutorial for, I would be more than happy to help out! This is a great app to have students work on explaining the steps to a process (cooking is all about following steps! ), using math to scale the recipe to the number of people that you are cooking for, applying science to explain different reactions that occur when certain ingredients are combined, or to have students find a dish that relates to a country or culture that they are researching. This app can be used in many ways by a number of grade levels, content areas, and units. While it's a "sweet" addition to your technology toolkit, it is also the perfect way to incorporate something that students are around on a daily basis into your lessons. All Recipes from john stevens on Vimeo. Comic Life is an incredible app that allows the students to create a comic book about anything. There are templates available for your students to build off of or a blank canvas for them to build from the ground up. Your students can take pictures of real-life scenarios, create word problems, and so many more incredible things. Use this as an assessment tool or more... Just give it to your students and let them run with it! This is a must-have app for any teacher looking to interact with his/her students on a regular basis at their level. If you think about it, today's students are so ingrained in the technology that is available that we are doing them a disservice by offering our email. Students have Facebook, Instagram, Twitter, and so much more at their disposal. Edmodo is the perfect app (and Web 2.0 tool) to manage your classes, create online discussions, assignments, quizzes, polls, and so much more. Use this app to do just about anything! The best part about this program is that teachers can easily monitor the content that is being uploaded to the site and react instantly. With limited functions, students can only do what you can see. There is no cyber-bullying that goes unnoticed. There is no message that can't get sent to you via email or text. The bottom line is this - YOU NEED EDMODO. Untitled from john stevens on Vimeo. Simply a great screencasting app. Create multiple pages, use different colors, drop in graphing paper or lined paper, and so much more. This app is a must-have for the 1 iPad classroom as it will essentially replace 90% of your interactive whiteboard necessity. While there are some drawbacks, you need this app! Haiku Deck is the newest presentation creation app and website that allows you to include high resolution images covered under the Creative Commons Licensing. With Haiku Deck, simple is the new complex. There are no lame transitions, no annoying sound clips, and say goodbye to the clip art from your previous presentation software. Not only is it free, but it is powerful. Type in your title, add some text, and find images that match your text. Let me clarify: the app finds high-res images that match your text. There is no need to scour the internet for acceptable images to support the content that you are delivering. Of course, you could upload your own pictures, but their stock photos are nothing short of impressive. Setting up a graph or chart couldn't be easier. The Numbers app is a seamless transition for users of Windows software and even easier for anyone who understands the interface of the iPad. In social studies, teachers often comment that graphs are important and are highly tested. In science, students need to be able to determine velocity, flow rate, and much more from a graph or chart. In math, graphs and charts are used quite a bit. Taking this into consideration, the Numbers app is the perfect way to account for a number of rich units that integrate graphs of any kind. 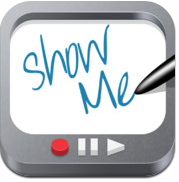 Another essential app that you must have is ShowMe. Its incredible whiteboard features make it a staple in almost every classroom setting. Use a variety of colors, record your lessons, erase and undo the work that has been written, embed pictures, and other great options. Although it does have some negatives, ShowMe is great! In math, have students use the temperatures to find the difference between highs and lows, one day to another, or city to city. Use the 5-day or 10-day forecast to apply mean, median, and mode. Set up the algebraic representation to demonstrate the change in temperature. Graph the temperatures on a line graph to show trends, scatter plots, discuss positive and negative slope, and so much more! In language arts, The Weather Channel can be a great discussion starter for the setting of a story. Students can use the temperatures to write a script for a weatherman to read off in a daily newscast. Scaffold it down so that students write a one sentence summary of the temperatures for the week. Scaffold it up so that students research the cause of sudden spikes in temperature, wind or weather patterns, and why a certain region has different temperatures than another. In science, use The Weather Channel to discuss what is happening at various elevations. Have students apply their knowledge of density to a weather map that shows the precipitation that is projected for a given day. Knowing the types of clouds, have students predict the cloud structure based on the forecast for the day, weekend, or week. Weather Channel Math from john stevens on Vimeo. Use this great app to condense all of the words from an article, story, or any literary piece into a collage of words that enhance words that are used frequently and shrink the words that are less prominent. What is created is a unique montage that can be used to spark the discussion around the main idea of a story, key problems on a test, character description, and so much more. Check out the tutorial below for more ideas.